An interesting walk visiting some of the limestone features of upper Ribblesdale including Browgill Cave, the Calf Holes and Ling Gill. 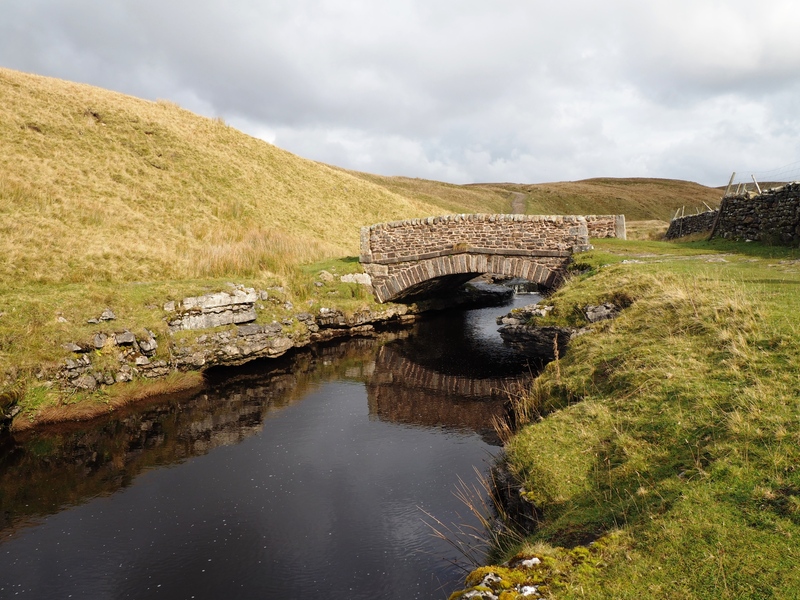 The aim of this walk was to visit some of the limestone features of upper Ribblesdale including a first time visit to Ling Gill, a narrow limestone gorge close to the Pennine Way. I also wanted to revisit the trig point on Cave Hill and get some better photos than my last visit nine years ago. Joining me on the walk was Tim from Bowland Walks for our first outing together since we’d enjoyed a good walk up Ease Gill back in March. Once again using Google Street View to find a suitable parking spot we arranged to meet at a handily placed layby on the road just to the west of Gearstones Lodge on Blea Moor Road. Our initial route was along an indistinct and short-lived bridleway to a bridge crossing Thorns Gill at a nice spot with plenty of limestone and a small waterfall. Over the bridge we joined the Ribble Way which we followed in a generally south-east direction. Again the path was indistinct in places and is probably not a good section to attempt in hill fog without good navigational equipment. Upon reaching the ruined buildings at Thorns the path became slightly less vague as it made its way past an old barn, across a wall and on to eventually reach Nether Lodge. From here on the walk got more interesting as well as much more solid underfoot. Indeed with the exception of one detour the rest of the walk was on a well built track. After crossing Ling Gill Beck at the natural limestone bridge called God’s Bridge we made a short detour following the fence uphill to visit Browgill Cave. This is the point that the stream which drops down into Calf Holes remerges into the open air. It is a splendid spot but unfortunately there was too much water in the stream to get too close to the cave mouth. It is definitely one to go back to in drier conditions. Returning to the track we joined the Pennine Way near the farm at Old Ing and then on to the stile that gives access to the impressive chasm of Calf Holes where the stream drops about 10m into a dark pool. It is a super spot but with a cave entrance and steep drops it is not a place to let children roam around. From Calf Holes Tim continued along the Pennine Way while I made my way up to the nearby trig point on Cave Hill. For a relatively modest height it is quite a good viewpoint. Despite not quite being high enough for Ingleborough to be visible beyond Simon Fell the panorama included amongst others Pen-y-Ghent, Cam Fell, Whernside and Park Fell. Catching back up with Tim we continued along the Pennine Way to eventually reach Ling Gill. Ling Gill is a narrow wooded limestone gorge and a dedicated National Nature Reserve. It is very steep sided and while access is not prohibited there were signs up with plenty of warnings of the dangers of entering, as well as a request not to set foot in Ling Gill Beck itself due to the risk of spreading crayfish plague. The only practical way to enter the reserve is by climbing down a waterfall at the head of the gorge near the pretty little Ling Gill Bridge. There was far too much water in the beck though for this to be practical and the surrounding rocks were far too steep and slippery to attempt to get down. Still we had good views down into the gorge from the Pennine Way. As we could not explore the gill we sat and had a bite to eat alongside the bridge before continuing up the Pennine Way as it left the gill behind and gradually made its way up on to Cam End. At the top of the track we came to a junction on the Cam High Road which has its origins as an old Roman road. Turning left on this we enjoyed a nice descent back down towards Blea Gill Bridge featuring superb views ahead of us of Whernside, Park Fell and Ingleborough. It was a lovely end to what had been a most interesting walk. Another great report Matt! Ling Gill sounds amazing; I’ll have to check it out sometime. I’ve done the Calf Holes to Browgill caving trip a couple of times now (though never explored that area on the surface), which has a beautiful underground waterfall at around the halfway point. The first time I did the trip, there was a girl from New Zealand in the party, who was wowed at the sight of the waterfall. Made me quite proud to think that there are scenes in the Dales that would have that effect on someone from NZ! Thanks Neil. Slightly jealous that you’ve done the underground trip. I bet that is amazing! It certainly was! With care, non cavers can actually get to the waterfall and back from Browgill without too much difficulty. Stephen Oldfield’s book ‘A Three Peaks Up and Under’ describes this really well and gives a lot of essential advice. Or, you can do as I did and go with a local caving club: the YSS runs an annual Try Caving weekend, which this year included the Calf Holes to Browgill trip.